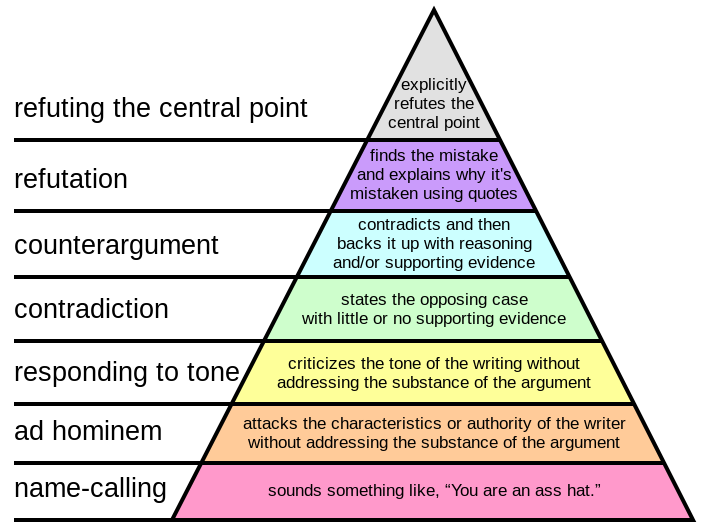 According to Paul Graham’s hierarchy of disagreement, it’s vital to refute your opponent’s central point in an argument. We would think the central point of the social justice movement, which is an outcrop of postmodernism, is the belief that truth is a social construct and identity is an illusion. Wrong. This may be the central point of a few leaders in the movement, but for most SJWs the central point is their lack of self. They have a lot of unprocessed emotional issues, which makes them feel unsafe, so they latch on to an alluring and simple ideology to feel safe. Therefore, when arguing with an SJW, refute their central point by making them feel safe. I recommend using the following phrases throughout the argument to keep them calm and reassured. A mollified SJW will end up agreeing with you, at least as a form of Stockholm syndrome. This is strange for SJWs to hear because they think, if you deny the existence of the wage gap, then you want to oppress women. But you recognize that tyrannical governments oppress women the most, and nothing has been worse for women than feminism. This psychological jab will stun them long enough to be more amenable to your points. SJWs are against hierarchies, but what happens when hierarchies begin to form in their generless, classless utopia, as they inevitably will? The SJW leaders would need to create an organization that crushes hierarchies, and if this organization is going to run efficiently, then it will need to be a hierarchy itself. The relief of social oppression leads to institutions that create physical oppression. Turn their argument around on them and make it seem like you’re the one who really cares about alleviating oppression. Otherwise, they will be emotionally unable to hear what you’re saying. One overlap those of us on the "Ron Paul" Right have with the SJWs is anti-imperialism. They think USA is oppressing the third while we think we’re wasting our time trying to help cultures that are, for the most part, too backward to understand we’re helping them. In a sense, we do care about the third world---we at least don’t not care about them, which is more than any SJW would give us credit for. It doesn’t matter when you say this in the argument and it doesn’t matter what this sentence is a response to---it makes the SJW feel safe, especially when you use the operative word, "feel." SJWs like that word because it helps them to have some form of epistemology that doesn't require thought. The main reason somebody latches on to a radically incorrect ideology is because they have no friends. Isolation invariably creates a lot of existential and psychological angst, which can be ameliorated when we pretend to understand them. Conservatives and liberals alike are perplexed by the social justice movement because they are perplexed by emotions. The SJWs project their deep-seated anxiety so all they see is fear. When we confront them, therefore, we’re confronting scared animals and so it’s best not to make any sudden, psychological movements. If our presence makes them feel more safe than their ideology makes them feel, then we can diffuse the situation. If this means treating political arguments like a Rogerian session, then so be it.